Chakra Balancing of all your seven chakras will bring you calmness and health! Learn how today! Why is balancing your chakras so important? It is because deep within, you all carry subtle energy that affects everything in your day. Your emotions, your physical energy, your thoughts, all affect your subtle energy system. Please read, Chakra Yoga first, to understand this subtle energy body better, if this is a new concept for you. 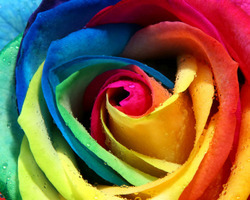 I love the beauty of the rose, a perfect example in nature to depict the unfolding energy of a chakra wheel. I like to imagine 7 roses, unfolding within me as I do my chakra healing exercises with simple yoga poses and movements. To get back into balance of your body, mind and soul, it takes conscious awareness and conscious effort for chakra balancing. I have created a chakra balancing meditation that involves opening and balancing of all your seven chakras through simple movements and yoga poses. This healing meditation for all the seven chakras is for those who do not feel drawn to any specific chakra for healing, but wish to keep them ALL open and healthy. This is the meditation for all the chakras, in one place. A simple, get-down-to-it type of meditation that is easy enough to do consistently every day. Doing these chakra healing movements are a simple way to do a quick morning meditation that will get you off on the right foot each day for continued health and healing. The movements are all done standing, so that you will energize yourself for the day. I filmed this meditation in the morning, just after sunrise, so you can join in at this energetic time. The movements are very simple and do not require great yoga skills! If you can stand and move your body at the same time, you can do this, easily. This chakra balancing meditation is only about 15 minutes, so you can easily fit it into a busy schedule. What is 15 minutes when it comes to your body-mind-soul health? If you would like more information on a specific chakra, please see my full series of chakra healing meditations for each of the specific seven chakras at the bottom of this page. These are designed for deeper work at each level. 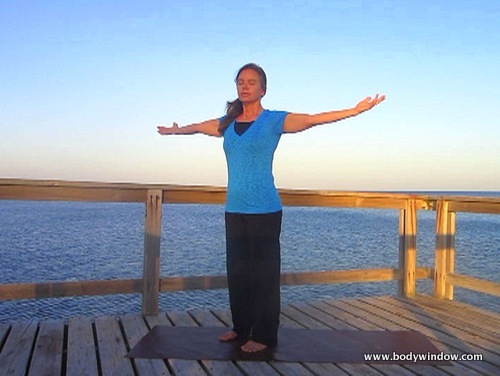 Opening and balancing your chakras in the early morning light! Open your arms to Love in your 4th chakra, as you join me in balancing all of your seven chakras. 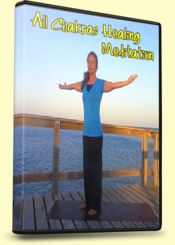 I filmed this chakra energy meditation in Roatan, Honduras on the pier at West Bay. It was a beautiful morning that I will always remember. Come say the seven chakra mantras with me, "I have," "I feel," "I can," "I love," " I speak," "I see," "I know." When you perform body movements along with your positive affirmations and your specific mantras, you invite the possibility of incorporating new chakra energy into your entire being, your mind, your heart and your body's cells. Follow the body-mind-soul wisdom in the quote below! You will combine at least four of the "doctors" if you do your chakra balancing meditation outside in the sun, with your bare feet on the earth, whenever you can! It will ground you in your first chakra energy to set the best foundation for healing! Come join me in the chakra balancing meditation for your seven chakras. May you find healing, always of your heart and your body-mind-soul! By purchasing this chakra healing video, you are aware that this is a digital product only, that you will need to download to your computer or device. No hard copy DVD will be mailed to you! May your healing journey through the body meditations found in this article and video leave you with open and balanced seven chakras! May your subtle energy body be ever healed and flowing! Namaste!